Dulce de leche has to be one of my favorite desserts. To find it in frozen form and have it covered in dark chocolate is just a dream come true. It not being too bad for me doesn’t hurt either. 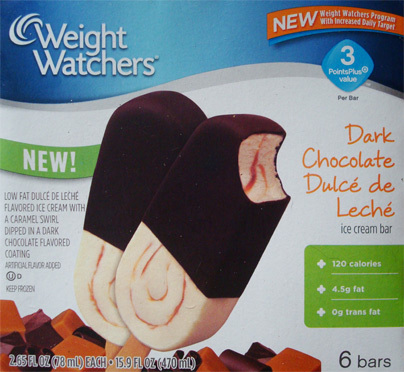 Weight Watcher describes it as “low fat dulce de leche flavored ice cream with a caramel swirl dipped in a dark chocolate flavored coating”. Well technically their description is in all caps but I don’t feel the need to shout at you guys. Minus all the “flavored” parts, that sounds like the make up for a good ice cream bar. I get a kick out of how these bars are only partially dipped. I know this is a diet bar but I can’t see it saving too many calories. The shell on this bar is also very fragile. I’d compare the thickness to about 1/3rd of that of your standard Klondike bar. I even tried to cut it to give a nice cross section but it just shattered the whole shell into pieces. I’ll give the shell points for having a nice crunch despite its lack of thickness. The flavor of the shell is distinctly dark chocolate with a slight bitterness to it. If you’re adverse to a strong dark chocolate you don’t have to worry about that here because it is pretty tame. The caramel flavored ice cream when sampled alone is on the sweet side. The caramel swirls just add to this sweetness and I can see some people thinking this will be way too sweet. No worries though because the dark chocolate shell works to temper the sweetness quite well. The combination of bitter chocolate and caramelized sugar is a nice combination. After having a bar, I can honestly say my craving have been satisfied and more. That’s saying a lot when it comes to a low fat treat that normally get scrutinized for their inability to compare to the real thing. Sure a Double Caramel Magnum bar is more tempting but these would suffice just fine for me. My only complaint with these is that since they’re low fat, they melt a lot faster than ideal. I like to savor my treats so it’s a race against the clock to make sure I don’t get any ice cream on me. Still for being a “better” choice for me, I wouldn’t be against picking these up again. Buy Again? If I need a caramel fix without all the calories, I couldn’t see why not. Sounds pretty good, i love treats that actually taste good but arent gonna do too much damage to the waistline!